Given the gloom and the rain we had on Tuesday, we realise that eating near the water is not going to be the glorious experience we’d envisaged. We therefore opt instead to take our English house-guest, Mark (Mr T’s first cousin once removed), to our favourite local – Let’s Eat Thai on Illawarra Road in Marrickville. This place serves up some of the best Thai food we’ve eaten in Sydney and it’s incredibly reasonably priced – we never seem to be able to spend more than about $25 per head. Its heritage is assured – the chefs here are veterans of Spice I Am in Surry Hills, our other favourite Thai restaurant in Sydney! When we first discovered this place, the odd one out in an otherwise Vietnamese-dominated restaurant scene, we became instantly addicted to the pad prik king with crispy pork, and have to order it every time we come here. And this occasion is no exception. The pile of chunky pork cubes are decadently fatty and slathered in the most delicious sweet, sticky curry paste, and topped with finely sliced kaffir lime leaves and red chilli. At Mark’s request we order fried rice, which we normally wouldn’t bother with, but it makes a nice change, filled generously with pieces of chicken and crowned with chunky slices of cucumber and lime wedges to squeeze over. We also choose a chu chee curry which has a thicker sauce than the usual green and red curries, and is deliciously creamy and tasty. We add to that my perennial favourite, a green papaya salad (or ‘tom sum’), crunchy, sour and chilli hot with little nuggets of dried shrimp, roasted peanuts, cheery tomatoes and raw snake beans. Other favourite dishes we’ve ordered on previous visits to Let’s Eat Thai include crispy fish salad, a potent concoction of crunchy fried anchovies, red onion, chilli, shallots, mint and coriander. This full-on flavour punch is not for the faint of palate, but we love it. 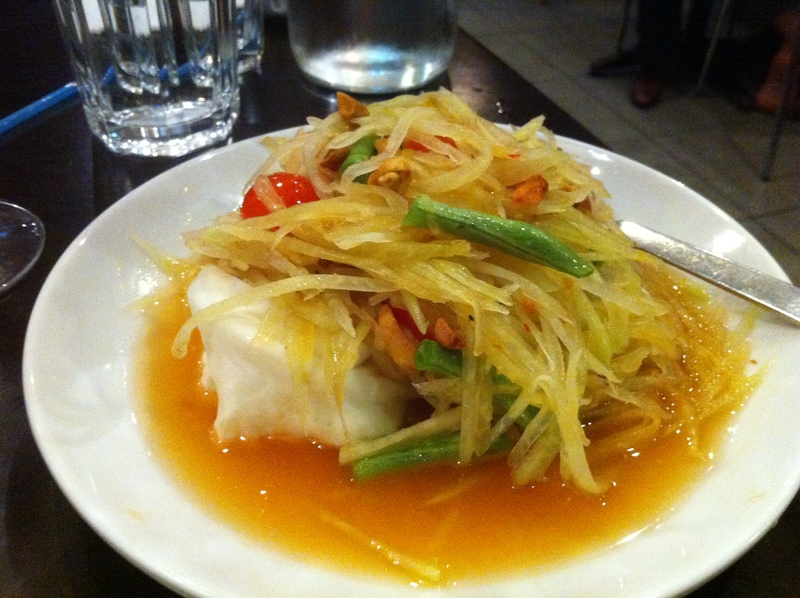 It seems to fit in the northern Thai category of dish which is typically very salty and sour. Expect to work up a sweat! The other is whole deep-fried snapper with mango salad. Underneath the huge pile of fresh, colourful salad, the fish is beautifully pre-portioned into crispy parcels of goodness – so there’s no messaging about with bones! 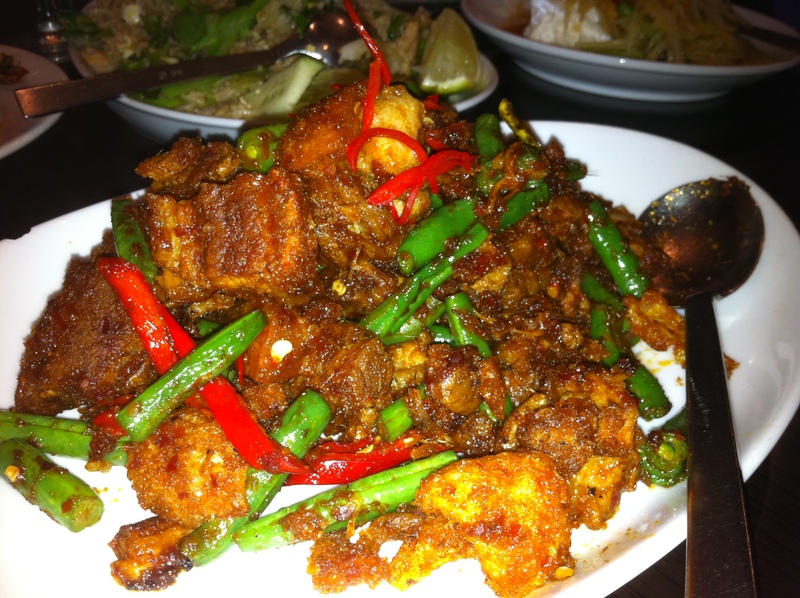 This entry was posted in Let's Eat Thai, Marrickville, Restaurants, Thai by oystersandoxtail. Bookmark the permalink.